Large swimming pool with outside entertainment area. Private garden with seating and lights, safe parking with automated security gate. Guesthouse TV lounge and garden available for guests. 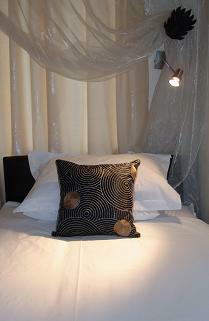 The guestrooms have been freshly decorated and new 100% pure cotton linen is used. Children welcome and stay for free. 10 minutes drive per car to Pretoria from the guesthouse. Transport available on a first come first served basis. We have a beautifull swimming pool with an entertainment area. The garden has a couple of places to sit and chat, near a fountain or under a tree. We have a very large trampoline and jungle gym in the children's play area. High quality bed linen and towels provided. Complimentary tea, coffee, chocolate drink and rusks in every room. B&B Stationary available and lots of magazines and books to read. Smoking allowed outside, no smoking inside the guesthouse. Transport available in Pretoria are to a limited number of guests, first booked, first served. Airport pickup available. 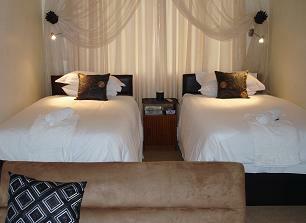 Romantically furnished self-catering double room with sofa, writing desk and self-catering amenities. En suite bathroom. Newly renovated. TV, hospitality fridge, sofa, microwave, tea and coffee facilities. Luxury linen, extra pillows and blankets. Romantic and luxurious self-catering twin bed self-catering studio with sitting area, dining table and kitchenette. Ensuite bathroom. 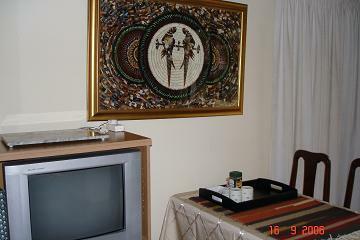 TV, hospitality fridge, microwave, kitchenette, tea and coffee facilities. Luxury linen. Private entrance and patio. Suitable for longer visits. Self-catering cottage with private entrance and full kithen. Suitable for long-stay families or two colleagues. Four beds in cottage, private bathroom (with shower over bath), fully fitted kitchen, TV lounge, direct access to outside entertainment area at swimmingpool. Lyttelton is a leafy suburb in Centurion. The area has a very good shopping complex nearby (Centurion Mall) and the locals are friendly! About 10 minutes per car to Pretoria, University of South Africa or the University of Pretoria. Championship size snooker table in lounge. Continental Breakfast included in price. Breakfast available for R30 per person and three course dinner for R65 each. To reserve your booking, please pay 50% for reservation. Cancellation 1 week before booking, 75% of fee applies. No refund for cancellations less than 1 week before arrival date, unless for hospital guests. From Johannesburg, take N1 highway towards Pretoria. In Centurion take the Botha Ave turnoff and turn left onto Botha Ave. At third stop turn left into Station Road and left again in Unie Ave. We are at number 44 (third house from the church on the corner). The Lyttelton train station is about 1 minute's walk away, but maybe not the safest transport for the tourists. Take a shuttle bus or mini bus taxi from the airport to Lyttelton taxi rank or directly to the guesthouse.